Thanks to Terry for popping the first Hangout for Connected Courses into Vialogues, so that we can contribute to discussions after the hangout (with Howard Rheingold, Alan Levine and Jim Groom) has come and gone. Here. they are talking about the concept of a Domain of One’s Own, and how someone might set up their blogging and informational systems, and more importantly: why you would do it. We talked about this in CLMOOC, too (inspired by these three dudes), with hopes that people will push back against established platform systems that can often hem learners in, instead of opening things up. Having your own space is a step towards defining your digital identity and presence. I know I blog with Edublogs and moving to my own domain doesn’t work for me, right now. But for folks who might be thinking about teaching an open learning system, it might make sense to host your own instead of turning to a prefab network space. What comes to my mind is as I listened to them chat, and explain some of the technical and philosophical issues with hosting your own space(s), is the issue of agency, and whether we define our digital spaces for own our needs or adapt what we want to do to the space we are in. I find I do both, and am always toggling around in that middle space. As a teacher, though, I try to teach my young students about the nature of “workarounds” and, as Howard notes, pushing the edges of the possible to accomplish your vision. Sometimes, it fails. That’s life. You just try again and re-workaround it (yeah, not a word but it works). The key thing here is to not let publishers and other platform creators define who we are as learners and as educators. I’m not saying I have figured it out every time (for example, I am using Edmodo right now with some teachers at an urban middle school through the Western Mass Writing Project and I am not all that happy with it. But, I am trading off “low entry” for these educators for “full functionality” for what I want to see happening. And yeah, “free” plays a role, too). Sometimes, it takes time, and incremental footsteps, to enact change. The video here helps frame that. Come be part of the discussion. So, even though I wrote a post yesterday that said I was gonna lurk, you can see how I easily get pulled into the mix. Just writing the post itself, as Howard noted in a comment, meant that I was no longer lurking with the Connected Courses, and the whole shebang hasn’t even started yet. One of the ideas that we really talked about and worked hard to value during the facilitation of the Making Learning Connected MOOC was how to best recognize and include those who were not ready to jump into the fray, but who either only wanted to watch or needed time to process before considering entry into the CLMOOC. As you might imagine, this stance of inclusion is made trickier by the invisible threads that connect participants to an online project. You just don’t know who is there, watching, if they never comment or participate. And if it is not a credit course where posting is required (the CLMOOC was not that), then it becomes even more of a challenge to understand the nature of participation. But that doesn’t mean they aren’t there, learning along with everyone. We found that out in the time between our first year of CLMOOC and the second, when we heard later stories of folks who lurked, brought ideas to the classroom or professional spaces, and then came back strong in the second year as active participants, grateful for the ongoing message of valuing those who lurk to learn. Others were a bit wary of the technology hurdles and needed time to process, to tinker on their own. And others just had little bits of time, so they popped in and out to see what was going on, but never participated. Not everyone is comfortable with learning in open spaces. This sort of goes against the grain of basic teaching philosophy, right? No child left behind? We assume everyone needs to be learning and we need to gauge that the learning is being done. In online spaces, we often do that by tracking comments and blog posts and Twitter feeds. You can’t look across the room and see that someone is not participating and tell yourself and/or them, I’m going to call on you next, kid, so be ready with some ideas. 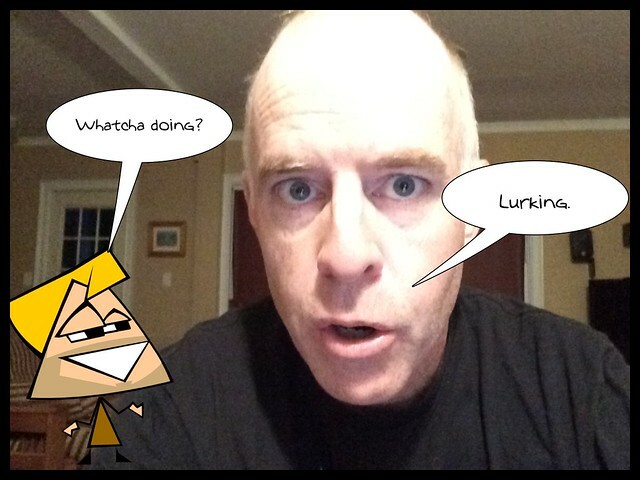 We don’t allow lurkers in our classrooms, do we? But they are there, and they are important to the network, and they need to be part of the conversation, even if the conversation can often feels one-sided. And sometimes, they party on. 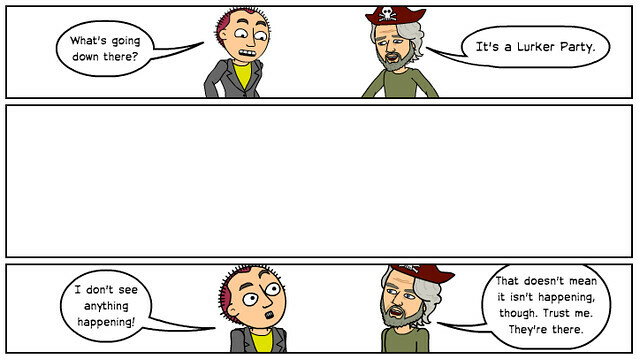 Thus, my comic. But I suspect I may be more of a lurker in the #ccourses this fall for a few reasons. The theme of the course seems to be university level (higher ed is right in the title). I know I will be swamped at the start of my school year with my sixth graders, and a new principal. And I am trying to figure out what the heck I doing for my K12 Online Conference Keynote presentation. Still, I want to be tapped in, watching things unfold. So, I am putting on my lurker hat and swimming around the edges of this Connected Courses concept, hoping to steal some ideas and engaging in conversations when I can.